Prior to beginning the import process, please print and review the General Import Overview information found in the CYMAIV online help (press F1 from any CYMAIV screen) and print the instructions found on this page, including screen captures. 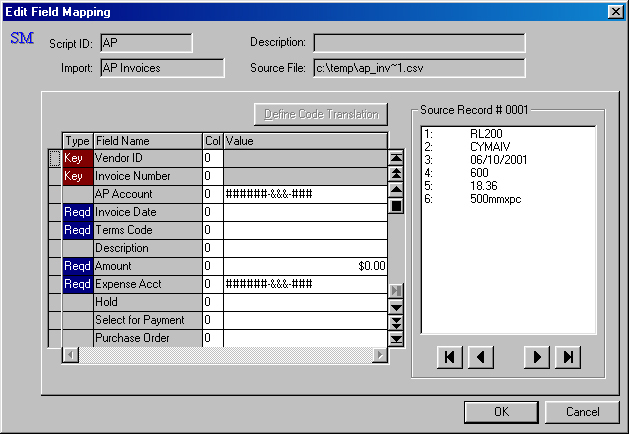 Generate a comma-delimited file from the Food Track system containing the AP invoices you wish to export to CYMA. Contact your Food Track representative with questions. Prepare a General Import Script inside CYMA that matches the file from Food Track. A sample file is illustrated below.